The Ibiza Sun Apartments offer the perfect accommodation with modern style at an excellent location, only 200 meters away from the most extensive beach in Ibiza, Playa d’en Bossa, with a 10 minuts drive to Ibiza town and the airport. 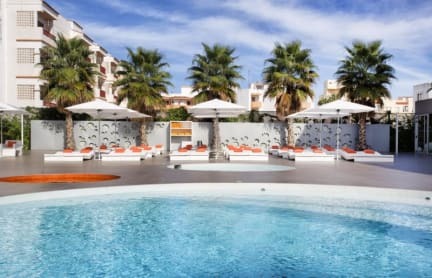 This hotel boasts an alluring ambience and accoutrements where you can lie back, soak the sun, chill at the swimming pools or Jacuzzi and indulge in some treatments around our swimming pool and enjoy a selection of spirits and cocktails. Our multilingual staff will cater for you and make you feel welcome and valued. We offer a Junior Suite with 38 m². Maximum occupancy 3 pax. Air conditioning, 32” Satellite flat-screen TV in the living room and bedroom, double or twin bed with 1,40 m sofa bed. Bathroom with hair-dryer and walk-in shower and amenities. Fully equipped kitchenette with toaster, microwave, refrigerator, coffee maker, vitroceramic hob, dining and sitting area, LED ambient lighting, safety box free of charge and free WiFi access. And a Suite 78 m2. Maximum occupancy 4 pax. Air conditioning, living room with 42'' satellite flat-screen TV with radio. One double room with a 1,80 m bed (or 2 singles beds of 90 m each), 25'' flat-screen TV and a balcony, and another bedroom with a 1,35 m bed, plus 1,40 m sofa bed in the living room, a generous private terrace lounge, bathroom with hair-dryer, large shower, bathrobe and slippers, safety box free of charge, fully equipped kitchenette with toaster, microwave, vitroceramic hob, refrigerator, and free WiFi Access. Our strategic location, 3 km from the Centre of Ibiza and just 200 meters of one of the most extensive beaches of the island, makes us a perfect choice both for those who want to have fun in the famous clubs and for families who prefer relax, and not forgetting the proximity to the already recognised Beach Clubs of Playa d'en Bossa. Check in from 16:00 to 18:00 . Payment upon arrival by credit cards, debit cards. This property may pre-authorise your credit card before arrival. Children and extra beds - All children are welcome. lease let Ibiza Sun Apartments know your expected arrival time in advance. You can use the Special Requests box when booking or contact the property. Please note that breakfast is served from 08:00 to 11:00.